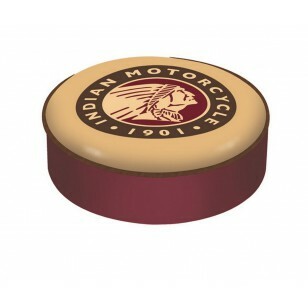 Enjoy rider style with the Indian Motorcycle Seat Cover. Made exclusively by Holland Bar Stool Co.
Made for the ultimate Indian Motorcycle fan, show love for this American classic with this knockout from Holland Bar Stool. This Indian Motorcycle bar stool cushion cover is hand-made in the USA by Covers by HBS; using the finest commercial grade vinyl and digital UV printing to give you the most detailed logo possible. This cover slips over your existing cushion, held in place by an elastic band. The vinyl cover will fit 14" diameter x 4" thick seats. This product is Officially Licensed. Make those old stools new again with the help of Covers by HBS!